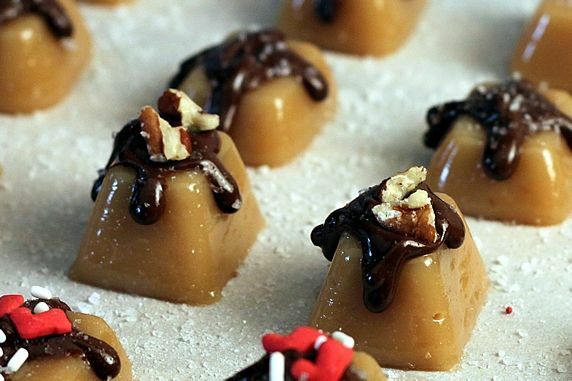 This is the perfect size for making one batch of this caramel recipe. 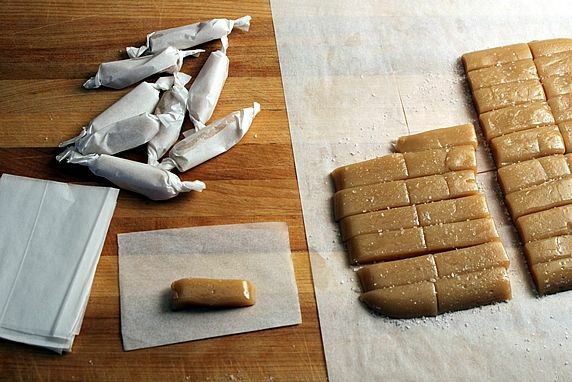 A handy tool for making uniform portions of these caramels; also cookies & meatballs. 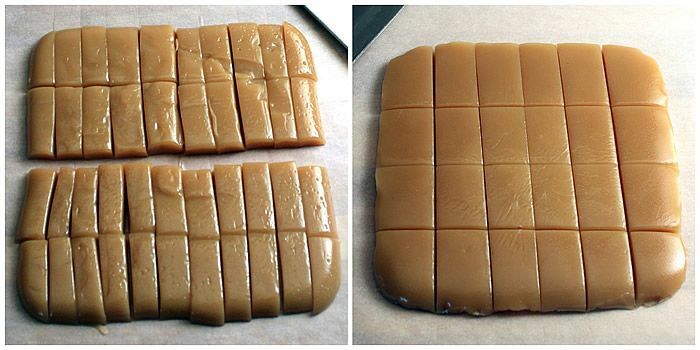 Use as a mold for uniform caramel shapes. Also handy for freezing garlic, ginger, and herbs. 6-oz bottles for drizzling melted chocolate. Use this for wrapping individual caramels. 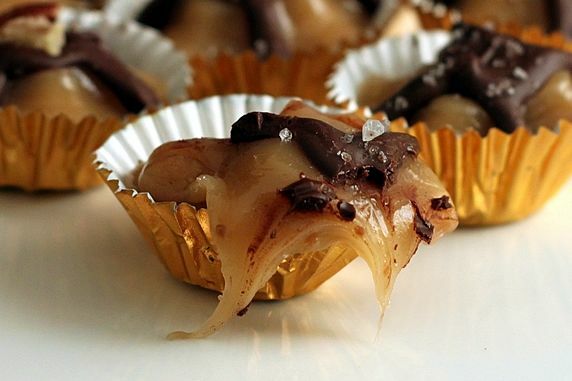 These are a great way to serve these caramels on a party platter. Or, arrange them in a box for gifting. They're too easy to taste this good! These delicious sweet & salty caramels are chewy, gooey, and creamy. They taste too good to be this easy! 1. 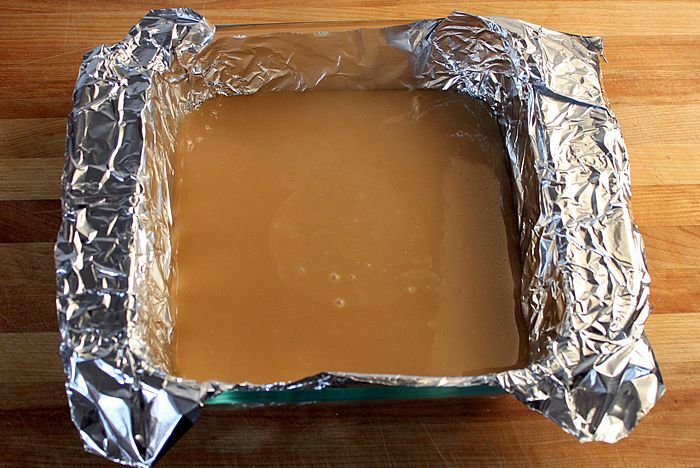 Line an 8x8 baking pan with aluminum foil, coat the inside with cooking spray, pour in the hot caramel. Place in fridge until firm enough to remove & cut (approx. 40-60 min). 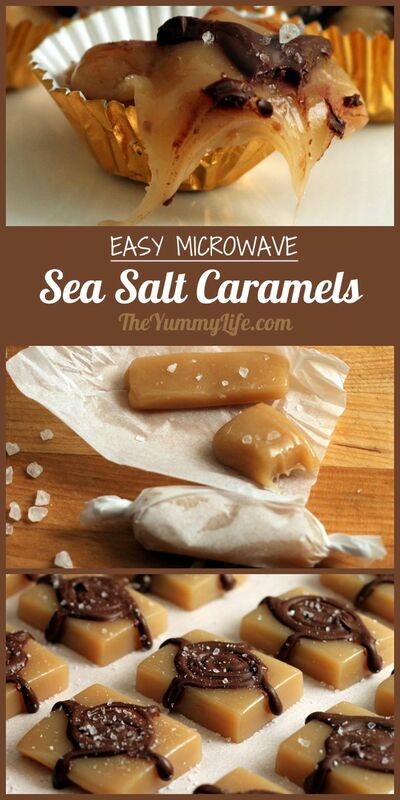 Pull up on sides of aluminum foil and remove the whole slab of caramel at one time. Place caramel slap on cutting board covered with parchment or waxed paper and cut into pieces of desired size. 2. Coat 2 plastic mini ice cube trays with cooking spray. Allow hot caramel to cool for 10 minutes after removing it from microwave. Use spoon or small scoop to fill sections of tray. Place in fridge until firm (40-60 minutes). Invert trays and twist and tap until caramels fall out. If the caramels are oily from the cooking spray, blot them off with a paper towel. Sprinkle coarse sea salt directly on top of caramels if not adding chocolate drizzles. The recommended cooking times in this recipe are based 1100 watt microwave. If yours has a different wattage, you will most likely need to adjust the cooking time accordingly. Because microwaves vary, there may be some trial and error involved to determine exactly the correct cooking time. (Microwave wattage can usually found on a label that is visible inside of the microwave.) If caramels are too hard, cooking time should be reduced. If they're too soft cooking time should be increased. 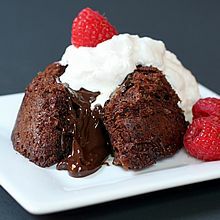 --Drizzle with melted chocolate. 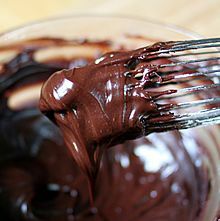 Melt chocolate chips with oil in microwave at full power in 20 second intervals, stirring and continuing to cook just until melted (approx. 60 seconds total). 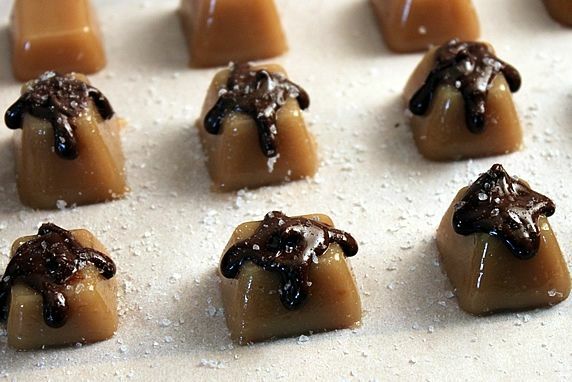 Drizzle on caramels with spoon or condiment bottle. While still wet, sprinkle with coarse sea salt. --Sprinkle wet chocolate with chopped nuts or decorating sprinkles. 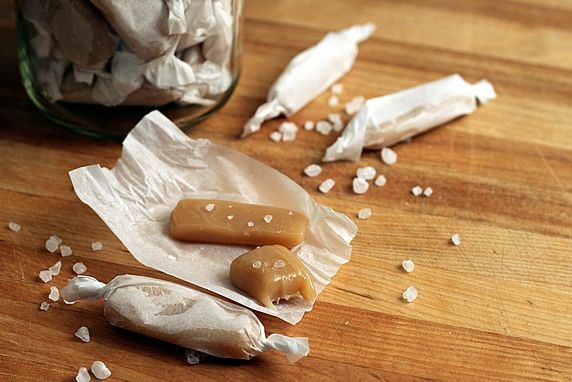 STORAGE: Caramels are sticky and easier to remove if stored on parchment paper. 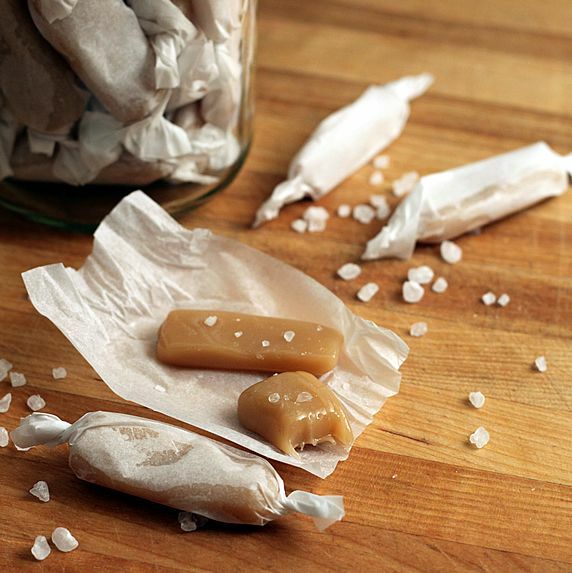 Wrap individual caramels in parchment paper or place in single layer on top of parchment paper in covered container. Store caramels in fridge or at a cool room temperature. (They may lose their shape if they get too warm.) If refrigerated caramels are too stiff to eat, bring to room temperature before eating. A sweet & salty flavor combo is hard to beat, and it's especially delectable with caramels. 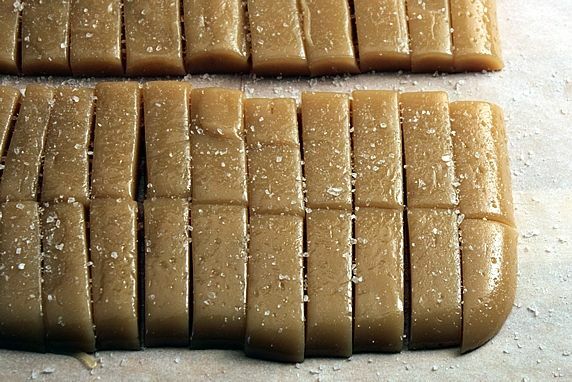 I'm excited to have hit on such an easy microwave method for making caramels that doesn't sacrifice any flavor or texture. These caramels are creamy, buttery, chewy, and delicious, and I love that there is no stove-top fussing with a candy thermometer. I've made this recipe many times and every batch has turned out great. Once you determine the exact cooking time needed for your particular microwave, the recipe is reliable and foolproof. 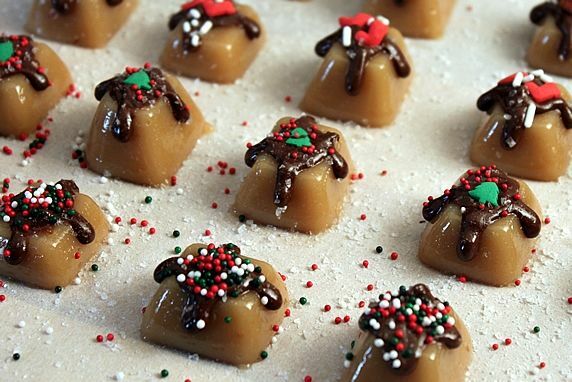 The caramels can be made in different molds and shapes and with a variety of toppings. I have a separate post with gifting ideas and printable tags. It would be hard to find anyone who wouldn't love having these treats as a gift. Step 2. Cook the caramel. 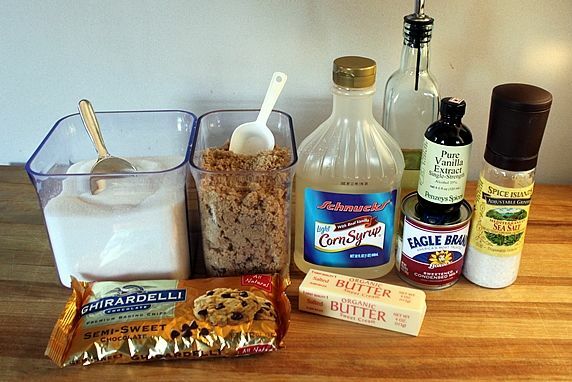 Combine the sugars, corn syrup, vanilla, butter, and sweetened condensed milk in a microwave proof bowl. The bowl should be at least 2 quarts to allow for the caramel to expand as it cooks. The recommended cooking times in this recipe are based on my 1100 watt microwave. If yours has a different wattage, you will most likely need to adjust the cooking time accordingly. (I found my microwave wattage on a label that is visible on the inside of the microwave.) Because microwaves vary, there may be some trial and error involved to determine exactly the correct cooking time. Click here for a cooking conversion chart for different wattages that I found online. I don't know if the chart is perfectly reliable, but it may give you some guidance in making adjustments. Your caramels should be chewy and easy to eat--not a challenge to your dental work! If they turn out too hard, you need to reduce the cooking time. If they're too soft, increase the cooking time. Step 3. Pour the hot caramel into a mold. I'll demonstrate 2 options. Line an 8x8 baking dish with aluminum foil, making sure the foil extends up the sides. Coat the foil with cooking spray. Pour the hot caramel into the dish and put it in the refrigerator until it is firm enough to cut, 40-60 minutes. Remove from the fridge. The firmed up caramel will have taken the shape of the dish, so you can lift by the foil edges to remove the entire piece at one time. Peel off the foil. 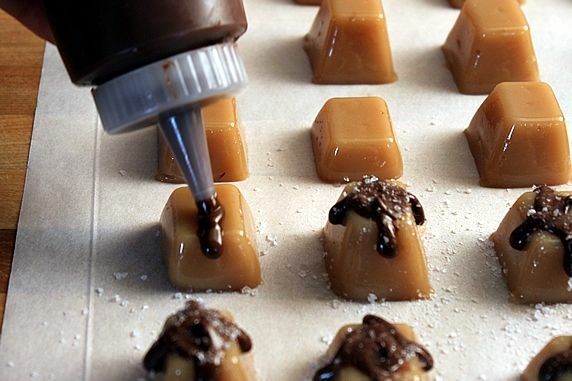 Use a large knife to cut the caramel into whatever size you prefer. The photos below illustrate cutting 40 pieces or 24 pieces. If the cooking spray has made them too oily, blot caramels with a paper towel. Hint: Put the caramel on a sheet of parchment or waxed paper for easier cutting and removal later. Otherwise, it may stick to the cutting board. After microwaving the hot caramel, let it cool for 10 minutes so that you don't melt the plastic tray. Coat ice cube trays with cooking spray. Spoon caramel into the ice cube sections. I used a small scoop to simplify the task. One batch of caramel yielded 30 mini cube caramel candies. Remove from fridge and flip trays over, twisting and tapping until caramels fall out. I placed them on a piece of parchment paper to prevent sticking. If the cooking spray has made them too oily, blot caramels with a paper towel. Step 4. Sprinkle generously with coarse sea salt. Press it in gently. Step 5. Wrap individual pieces in parchment or waxed paper and twist the ends. Store in fridge or at a cool room temperature. Parchment paper worked the best for me--the caramels release easily without sticking. 4" x 3" paper rectangles are the perfect size for wrapping 40 lof these log-shaped caramels cut from an 8" x 8" square pan. Store in fridge or at a cool room temperature. Love that sweet & salty combo. Yum! Update about shipping: I had a question about shipping these in the comments section, and I thought this was worthy of mention here so you don't miss it. If you want to ship the salted caramels, I recommend the plain, log-shapped ones pictured above, individually wrapped in parchment paper and twisted on the ends. 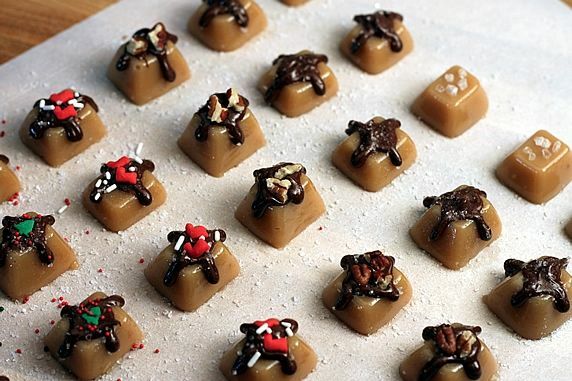 The wrapping helps the caramels keep their shape and keeps them from sticking together. I don't recommend shipping the decorated caramels illustrated below. They may lose their shape if they get too warm during the shipping process. 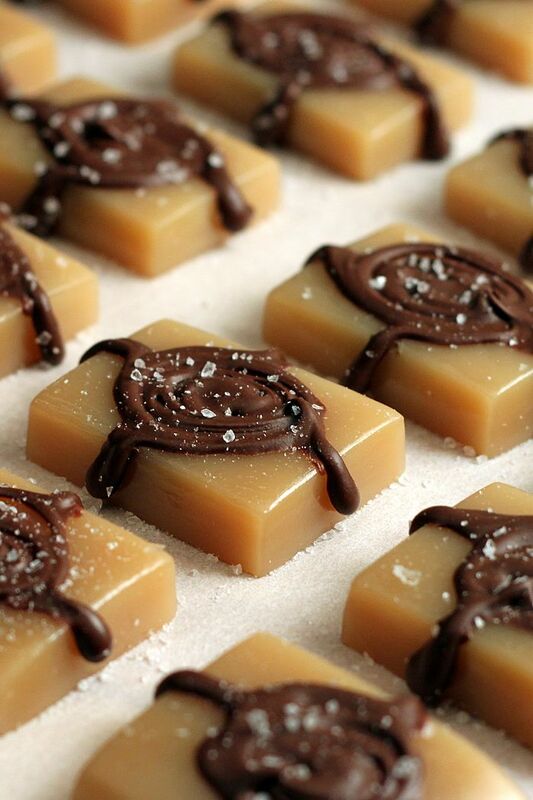 Here are some optional ways to add different flavors, colors, and textures to your caramels. 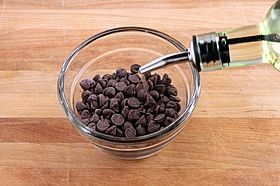 Add 1 tablespoon of canola oil to 1 cup of chocolate chips and microwave at 20 second intervals, stopping to stir each time, and continuing to cook just until melted--approx. 60 seconds total. 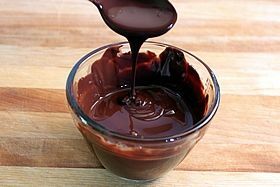 Drizzle on the chocolate with a spoon, or use a squeeze bottle. An alternative to the bottle is to put the melted chocolate in a plastic ziploc bag, push the chocolate down to one corner, twist the top of the bag, snip a small hole in the corner of the bag, and squeeze the chocolate out through the hole. You can add decorating sprinkles in holiday or any theme colors. Add nuts for some crunch and yum. These taste like turtle candies. Using the ice cube tray molds makes these uniform in size and shape. Add a variety of toppings and arrange them in a single layer in a small box. They'll look like they came from a candy store! Caramels are sticky and easier to remove if arranged so they don't touch each other and are stored on parchment or waxed paper. Wrap individual caramels in parchment or waxed paper or place in single layer on top of parchment/wax paper in covered container. Store in fridge or at a cool room temperature. They will lose their shape if they get too warm. Refrigerated caramels are too stiff to eat and should be brought to room temperature before eating. Caution about paper candy cups: I tried inserting the caramels into 2 different kinds of paper candy (mini muffin) cups with mixed results. The caramels stuck to the regular paper kind and were impossible to remove without making a mess; but they released fine from foil or non-stick parchment liners. Cutting small pieces of parchment paper to set them on works, too. Here's the best part...biting into one of these gooey, chewy, creamy treats. SO, SO GOOD. Too good to be this easy! Want to give these caramels as a gift? Check out my post with packaging ideas and printable tags.